The debut collection of a writer whose accolades precede her: a Whiting Award, a Rona Jaffe Award, a Best American Essays selection, and a Pushcart Prize, all received before her first book-length publication. This book represents a major break-out of an entirely new brand of nonfiction writer, in a mode like that of Ander Monson, John D'Agata, and Eula Biss, but a new sort of beast entirely its own. Things That Are takes jellyfish, fainting goats, and imperturbable caterpillars as just a few of its many inspirations. In a series of essays that progress from the tiniest earth dwellers to the most far flung celestial bodies--considering the similarity of gods to donkeys, the inexorability of love and vines, the relations of exploding stars to exploding sea cucumbers--Amy Leach rekindles a vital communion with the wild world, dormant for far too long. Things That Are is not specifically of the animal, the human, or the phenomenal; it is a book of wonder, one the reader cannot help but leave with their perceptions both expanded and confounded in delightful ways. Since receiving her MFA from the University of Iowa in 2005, Amy Leach has been recognized with the Whiting Writers' Award (2010), a Best American Essays selection (2009), a Rona Jaffe Foundation Award (2008), and a 2011 Pushcart Prize. Her essays have appeared in numerous literary journals and reviews, including Tin House, Orion Magazine, A Public Space, and Los Angeles Review. She lives in Chicago, where she plays the piano, performs in a bluegrass band, and teaches writing at Loyola and Northwestern Universities. Q&A with Amy Leach, author of Things That Are Your essays peer into the often-overlooked phenomena of the natural world; what do you hope your readers will gain from your writings? Amy Leach: Someone told me that animals are disappearing from our dreams. It is sad, and impoverishing, that animals are underrepresented in our imagination, our art, and our lives. One of the things I was trying to do, in writing these essays, was furnish my own imagination with various creatures, various lives, various experiences of the world. This project brought me a lot of joy, and joy is what I'd hope to share with readers. What is your favorite word, whether real or made-up? When you love a word, do you fill your pages with it or save it for the perfect moment? Amy Leach: My favorite word is dog and I could say it all day long, though I restrained myself in the writing of this book from sprinkling every sentence with dogs. It was interesting rereading the essays all together and noticing which words turn up repeatedly, like oblivious. I think I am always writing it down in my notebook as a word to use, oblivious to the fact that I have already used it many times. I also love the word sheep and am not temperate in using it. Space dust, pea tendrils, frogs from Borneo, and the Earth's mousy core--your essays range wildly between species and phenomena. Where do you pull inspiration from? Have you ever pulled a dictionary of natural history off a shelf, opened it to a page, and simply said, "I think I'll write about the Pinwheel Galaxy today"? Amy Leach: A friend shipped me a 24-volume wildlife encyclopedia several years ago, and that has certainly provided frog inspiration and mouse inspiration. Sometimes inspiration came circuitously: the pea-tendril essay started out as a cabbage essay, and the panda bear essay started out as an essay about neutrinos, with panda bears as minor characters; in both cases I had to abandon my first subject for one that interested me more. Of course sometimes inspiration arrives more directly: seeing bright red mushrooms in the forest, squirrels chasing each other underneath ferns, moths walking across parking lots. What about research outside the encyclopedia? Do you seek out natural phenomena off the page? Amy Leach: Writing each essay was its own complete experience. While I was writing "Silly Lillies," I bicycled up to the botanic garden every other day to admire the huge ruffly lotus leaves and the pink water lily blossoms. For the writing of the "The Wild What," I was in the Adirondacks where the stars shine unimpeded, and every night, after writing about the Great Bear all day, I could sit outside and appreciate the Great Bear itself. 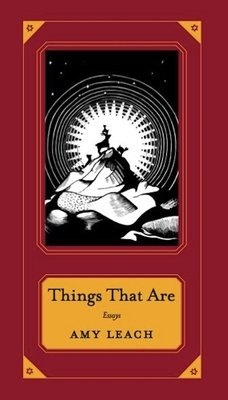 The book includes a "Glossary of Strange Beasts and Phenomena" which contains entries that seem almost too fantastical to believe--did you invent any of these, or are they really all true? Amy Leach: Besides Planet Huffenpuff, I did not invent any of the words in the Glossary. But it was fun excavating old fantastic words and doing my part to restore to them their former privileges. Defining them, at the end of the book, took me back to fifth grade; I remember in fifth grade writing my own definitions of words; it's as fun as it ever was.